Stephanie P. Sanderson identifies the nuances of the incoming Personal Information Protection Act in relation to the GDPR (EU) and the similarities between the privacy and data protection regimes, in an article published in the HFM Global Bermuda Report 2018. Stephanie P. Sanderson, Partner, breaks down the Common Reporting Standard (CRS) and explains the impact that the global compliance measure has on insurance companies and captives in an article for the Captive Insurance Times, Issue 149 distributed at the Bermuda Captive Conference. The Government of Bermuda has amended the Bermuda Common Reporting Standard (CRS) Regulations to make nil return filings mandatory for Reporting Financial Institutions that maintained no Reportable Accounts during the applicable calendar year. The deadline for filing CRS reports for the 2017 reporting year is 31st May, 2018. However, the Ministry of Finance has confirmed that (for this reporting year) nil filings should be submitted by 1st August, 2018 to avoid penalties or sanctions. Virtual currency, initial coin offerings, and blockchain are at the forefront of the newest emerging financial industry: Fintech. With its size and ample industry expertise, Bermuda is uniquely positioned to spearhead the implementation of a regulatory structure that effectively balances the innovative drive of the Fintech industry and compliance with prudential international legal and regulatory standards. The Government of Bermuda has announced various developments as Bermuda quickly becomes the global leader in the Fintech industry. This article provides a summary of these developments. Stephanie P. Sanderson, Partner in the Corporate Department, discusses M&A trends and practices in Bermuda in the Lexology Navigator 2018. Stephanie Sanderson provides analysis of the statutory rights and protections afforded to minority shareholders in relation to M&A, takeovers and squeeze-outs as well as the body of case law relating to this area of law. Alex Fox and Kit Cunningham discuss why the Bermuda LLC is particularly accommodating to start-up companies across a wide array of industries, including technology, film and music, retail, manufacturing, and distribution. The abundance of flexibility enables entrepreneurs to design a corporate structure that is simple, efficient, economic and above all – protects their personal assets. Kit Cunningham, Corporate Attorney at BeesMont, provides an informative article on aviation finance and aircraft registration. He explains that these areas, and particularly aircraft leasing and aircraft lessor securitisation, are experiencing a boom on a global scale, and that these transactions provide the opportunity to employ innovative mechanisms. BeesMont is pleased to have contributed the Bermuda Chapter in China Offshore 7th Annual Company Formation Guide, led by Stephanie Sanderson, Corporate Partner. The publication is now available online. Please click here to access the full publication. 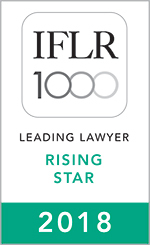 Stephanie Sanderson, Partner in the Corporate Department at BeesMont Law, has been recognised by IFLR1000 as a Leading Lawyer Rising Star based on transactional evidence as well as peer and client feedback. This recognition marks Stephanie as one of outstanding individuals listed by IFLR as a ‘Leading Lawyer’ of the future who has demonstrated her skills and potential by advising on innovative transactions.